Welcome! We invite you to enjoy the magic of Birch Bay - an aquatic summer paradise, next door to Vancouver, B. C., Seattle, and the cities of the Northwest. Over the decades, families and generations, of all ages have come to love this idyllic spot with its sheltered warm, shallow waters, and so many aquatic and recreational activities. Gather the kids, grandparents, and friends and join us for a fun filled, relaxing vacation that will linger in your memories for years. Now, with three units, VRBO 192841, 584142, side by side, upper units and 404881 a lower unit, all with great ocean views. Now, we can accommodate larger groups, extended families, gatherings, and reunions. Enjoy the views of the Bay and the Gulf and San Juan Islands, from our living room and front deck. The rear 'garden deck' is outdoor living at its best! Start the morning with coffee, the morning paper or breakfast. As the sun rises from the east, flowers, trees, and the greenery of the garden setting, come to light. At midday, lunch or snack with the sun overhead. Later, at happy hour, visit with friends, and family, and enjoy a cocktail or glass of wine before dinner or a BBQ. After dinner enjoy dessert, coffee, conversation, and the sunset as the sun slowly fades behind the mountains of Vancouver Island. An end to a perfect day! And, as our guests report, a perfect vacation! This view unit occupies mid and top levels at the Jacob's Landing Complex. Architecturally designed, and spacious with nearly 1,000 square feet, it features high vaulted ceilings, with floor to ceiling windows and is decorated in a Mediterranean theme. Living room, kitchen, dining area, bathroom, washer/dryer, and bedroom plus front and rear decks, complete the layout on the main level. A second bedroom, adjacent bathroom with shower, and private sleeping loft complete the top level. Meals prepared in Irene's fully equipped kitchen are guaranteed to satisfy the heartiest and most demanding appetites and extend the family budget as well. The large island bar facilitates food preparation and provides seating for four. An adjacent bar height dining table seats four. The pantry is stocked with staples; flour, sugar, tea, coffee, canola and olive oil, and a wide assortment of spices. Bon Apetit! Our guests love the heated Olympic swimming pool, summer and winter alike. The racquet ball court and game room for ping pong and foosball, and the two tennis courts, add to their enjoyment. Our guests walk or bike from the front door to a scenic path following the perimeter of the bay. Golfers will discover two championship courses, within 5 minutes of the condo. And those seeking strenuous walking will find the trails of Mt. Baker and Mt. Shuksan, one hour to the east. Because of its sheltered location, Birch Bay warm and shallow waters are perfectly safe for all ages. At low tides, children can explore the sand bars, hunting for clams and crabs, or building a sand castle or flying a kite. Birch Bay is also perfect for kayaking and boating, with a convenient boat launching ramp at Birch Bay State Park. And lastly, the area is classified as one of the most important birding areas and bird watching is a popular past- time. Watch for bald eagles. Bed linens, towels, beach towels, and kitchen staples provided. Bring only groceries, and personal items. Our Birch Bay home has all the comforts, conveniences, and amenities of our own home, and we do not expect our guests to accept less. Keywords: Luxury Accommodation , just steps from the Bay. Comfortable, for families, couples, and singles. Year round indoor, heated olympic size swimming pool. Spectacular 'Ocean views'. Originally from British Columbia, Jack and Irene have long enjoyed the recreational attractions of BC and Washington state. Irene's family moved to Southern California, which led to a banking career and a Vice-Presidency at a major bank. Jack's career in engineering, took him from Western to Eastern Canada and the US, where he completed his graduate education in Business Administration, and started a teaching career. Later, he returned to the west coast as a Professor of Management at the University of Southern California. They are car enthusiasts, students of history, and political science and enjoy frequent travel to Europe. San Diego is their California home, and Birch Bay their home in Cascadia. They invite you to share it with them. 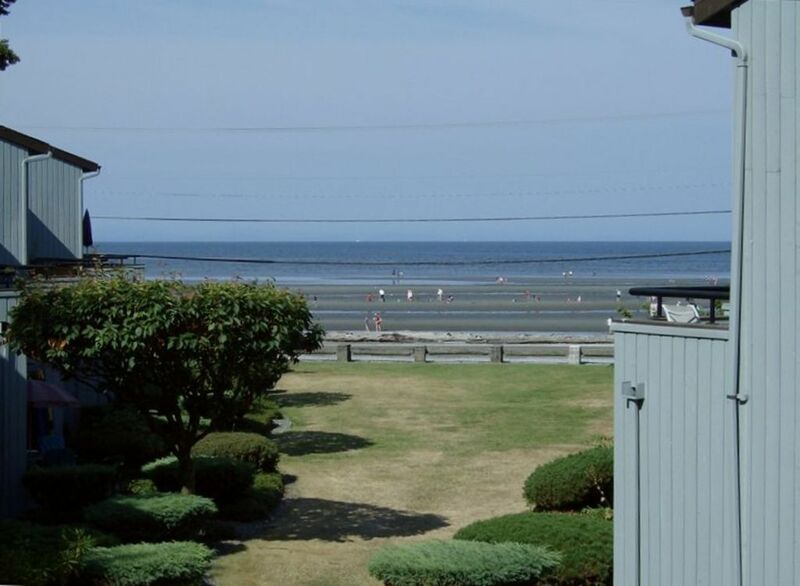 Birch Bay is the hub of an incredibly attractive vacation area embracing lower British Columbia, Vancouver Island, the Olympic Peninsula, the Gulf and San Juan Islands, Whatcom County, the Cascades and Vancouver and Seattle two of the most attractive cities in North America. And easily accessible from most parts of North America through Bellingham, Vancouver, and Seattle International Airports. Jack's introduction to Birch Bay was at age 2. Since then we have sailed and fished in the San Juan and Gulf Islands, skied at Mt. Baker, climbed Mr. Shuksan, and biked on Vancouver Island, the Fraser Valley, and Whatcom County. And a return each summer to enjoy blueberry, raspberry, blackberry picking and Salmon BBQ's is a highlight of each year. We love this part of the world and this is a return to our roots. Back deck with BBQ and table set is great for having morning coffee and watch the sun come up and a cool place in the afternoon for cocktails, and dinner ..The front deck facing the water is lovely in the mornings, and ideal for viewing evening sunsets. Everything was to our satisfaction. We had everything we needed and it was a very comfortable stay! Just a wonderful place. All the amenities we could ever want. GREAT HOST. I really enjoyed my time here after flying in from Maine. Had a great Thanksgiving here with my family of 7. Everything was there for us to celebrate. Turkey came out great. The host is VERY helpful. Always responded to my questions. Had fun in the pool with the grandkids. Beautiful view. Birds everywhere. Watched hummingbirds all the time. Nice place to walk. Good restaurants open year round. Close to cute shops in Blaine. Wonderful. We stayed in this unit with my parents, husband and a 5 year old son for three nights. The condo was a good size for us. The condo has been renovated beautifully and equipped with everything we needed. We loved seeing ocean from the large window from the living room and from the deck. The community has a indoor swimming pool and a hot tub which we enjoyed. It's within walking distance to restaurants and shops. We brought our paddle board and enjoyed calm and shallow water of Birch Bay. Irene is very attentive and easy to communicate. She mentioned she has two units in the same community. It will be fun to rent both of them for a larger group. Thank you for sharing your unit, Irene! Beautiful space at a beautiful place. Very comfortable and homey. The best part was the alcove upstairs. Not only was it the perfect sleeping space for my grandsons but they thought of it as their secret hideaway. When we had to be indoors, they were quietly and contentedly stored away! Had a fantastic time in Birch Bay. Would recommend this property over and over again. Had everything we needed and more. Property owner is fantastic and very easy to work with.....wealth of information !!!! Well maintained, clean, and spectacular view. Really enjoyed our stay here, the pictures really don't do the location justice. Lots to do nearby, and plenty of space for my grandchildren. A second bathroom was welcome! Water slide park is less than 1 mile away. There is also go carts, put-put golf, mini train, and of course the famous 'C-Shop' for ice-cream and candies, etc. HOLIDAY RATES - LOW AND SHOULDER SEASON - $150.00 a night - 3-4 nights minimum * Booking fee of $300.00 guarantees rate and dates, and applies toward rent. * Full rent payment is due 60 days prior to arrival, plus a refundable key/security deposit of $300.00 plus a cleaning fee of $100.00. Cancellation: Booking fees can be refunded 60 days prior to arrival.